The concept of an underworld is as old as mythology. Ancient peoples frequently envisioned a realm of the afterlife beneath the ground, not as a metaphor, but an actual physical place. Mythological beliefs faded over time. With the scientific revolution, people widely accepted the idea of the Earth as a sphere. But we only saw what was on the surface. What was actually inside, taking up most of the space? This is when the idea of underground worlds came creeping back. 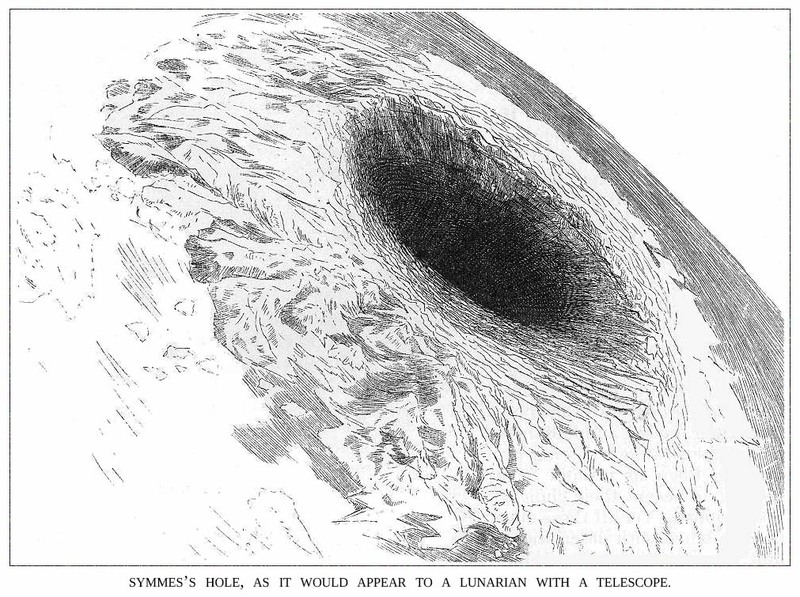 The Hollow Earth idea really took off in the early 1800s. An American named John Cleves Symmes Jr. proposed a detailed theory. He believed that the inner Earth contained concentric spheres, each with its own surface world. Sunlight filtering in through massive holes located at the poles kept these inner spheres warm and livable. He also thought centrifugal forces compressed the Earth at the poles. This meant that the polar regions, being closer to whatever inner heat source fed volcanic activity, were warm, tropical places. Symmes spent a lot of his own money preaching his theory. He used lecture circuits, leaflets, and letter campaigns to newspapers and magazines. Thanks to his hustle, he had a lasting influence on writers of speculative fiction at the time. Even in its time, most scientists derided the Hollow Earth theory. When actual polar exploration found no holes, that ended any serious discussion of this theory. Poe’s only completed novel actually takes place entirely on the surface of the Earth. The title character stows away on a whaling ship for adventure. Things go south, literally and figuratively, after a mutiny breaks out. Pym’s eventual journey takes him all the way toward the South Pole. It’s an adventure tale that speculates what might be found at the then-unknown Antarctic pole. Drawing from Hollow Earth theory, Poe imagined tropical lands and chasms opening into the Earth. Unfortunately, Poe also imagined horrific racial caricatures in the natives of these southern lands. Negative racial imagery pervades the rest of the story too, which was sadly all too common to speculative work of this era. Bulwer-Lytton is most famous as the writer who first came up with “it was a dark and stormy night.” This fanciful story is narrated by a man who falls into an underground world after a mining accident. He finds a race of people with telepathic powers, manipulating an energy source called Vril. The Vril-ya, as the people are called, have a “topsy-turvy” world compared to mid-19th century Britain. Women are bigger and stronger and choose whom to marry. The horror! After entangling with forbidden love, the narrator escapes the wrath of the Vril-ya with the help of his lover. The main takeaway is that the Vril-ya will one day run out of space and come up to the surface and wipe out humanity. This book’s reputation has suffered from its racial undertones and alleged association with the Nazis. It’s easy to see the connections. A superior race that needs to wipe out lesser inhabitants for living space? Yikes! The novel was popular with turn-of-the-century occultists whose ideas seemingly aligned with the Nazis. I’d take this last part with a grain of salt, though, as there’s no evidence of the Nazis believing in Vril or holding this book in any significance. After another forbidden love entanglement and another escape, we get an abrupt ending. De Mille seemed to be angling for a sequel that never came, since it was published posthumously eight years after his death. This is such a cool blog post! Sharing it. BTW, have you heard of Hollow World by Michael J. Sullivan? It’s a futuristic tale, and possibly not based on this, but it’s a WONDERFUL book 🙂 truly recommended. I think I’ll be checking out these books you mentioned. And thanks for reading this post, I’m glad you found it interesting!